This is a range of Free-Standing canopies where the canopy is a standalone structure. 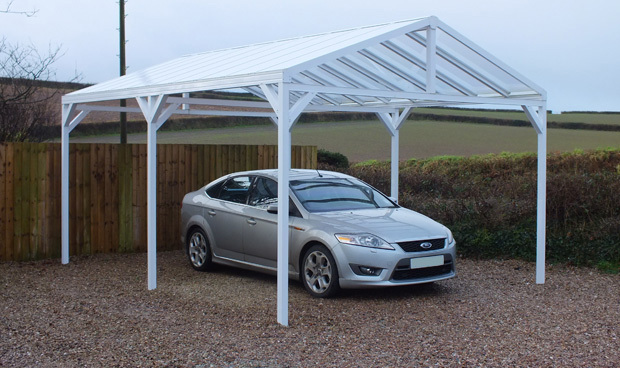 These canopies are ideal for use as a standalone carport. The standard glazing material is 16mm Clear, Bronze or Opal structured polycarbonate. 6mm Glass Clear Plate Polycarbonate glazing panels can be provided as a non-standard option. The range of standard options available start with a projection of 3.5m and 4.0m. The minimum width is 4.2m with a maximum width of 8.4m. Outer posts can be inset from the sides of the canopy by upto 500mm. Posts can be positioned upto 3.0m apart. Generally, all posts are located with same spacing between them. We can supply the canopy with metalwork in any colour. If you require a particular colour please specify this on your quotation form.